When a child moves out of the home, it can be both exciting and heartbreaking. As one phase of life is ending, another wonderful one begins. However, the danger lurking within the parents’ home and auto insurance, as well as within certain privacy laws, can often be overlooked. Both home and auto policies have limitations that can leave a family vulnerable in terms of its financial wellbeing, and privacy laws can leave parents in the dark about their child’s physical wellbeing. 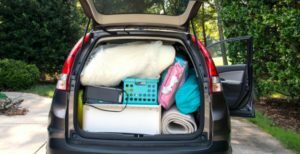 If a child is moving out to live with friends, they have, in effect, set up their own household. If a lease is present, it is clear that there is now a separate residence, even if the child is renting a unit owned by the parent. If a child is in college, they are typically considered part of the household. However, if during college they rent an apartment outside of the dorm system, then they have created a separate household. Addressing these issues will help secure the financial wellbeing and peace of mind for both the parents and the child. • While attending a cookout, a Frisbee flies off-course and lands at a person’s feet. They pick it up to toss it back to the thrower and when they do, the Frisbee misses and slashes someone’s eye. The injured party or their insurance company (health or disability) may come after the person who threw the Frisbee for compensation. • While in an apartment, the renter starts a fire which causes significant damage. The roommates, neighbors and landlord may pursue the individual for compensation. In addition, many leases hold the renter liable and not the landlord. Therefore, if a guest visiting the individual slips, falls, and is injured, for example, the renter will be the responsible party. For those starting out on a bright career path, they may live in a state where future wages can be garnished. If this is the case, without renter’s insurance, the liabilities described above could cancel out much of the financial benefits of the bright career. If parents or a trust financially support the renter, the injured parties might try to get to the parental or trust assets. Renters coverage will place a barrier between the parental assets that hopefully can pay for any liabilities and if there is a trust in play, the trust should be named as an Additional Insured on the renter’s policy. If the lease is in the parent’s name, the parents Homeowners policy should be amended to extend coverage E to cover the new location. In Massachusetts, once a child is no longer a resident of the parents’ home, they are no longer covered by the parents’ policy while driving vehicles not owned by their parents. If the child drives a rental car or a friend’s car, their financial wellbeing is at risk because they have no personal protection. In this situation, a Named Non-Owned Auto policy in the name of the child would be appropriate. A Named Non-Owned Auto policy is simply an auto policy without an auto listed and therefore has no Comprehensive and Collision coverage. If the child is driving a car provided by the parents, an alternative would be to retitle the car in the child’s name. If the child is using a parent’s auto for work purposes such as delivery or Uber, it is critical to report this to the insurance carrier. Unreported commercial use can reduce the limits of protection to Massachusetts Statutory limits such as reducing Bodily Injury of Others from $250,000/$250,000 to $20,000/$40,000. If the child takes the car out of the state, that must be reported as well to preserve the Comprehensive coverage for glass, theft, and vandalism. Once a person turns eighteen, a parent loses the right to know personal information about their child without the child’s permission. If a child is hospitalized, the hospital is not allowed to reach out to the parents or even share the child’s status with the parents. When a child turns eighteen, parents may wish to discuss with their attorney about obtaining a Health Care Proxy and a Durable Power of Attorney. When a child is making their way out of their parents’ home, it can be a dangerous period for the financial wellbeing of both the parents and the child. Insurance agents (and a lawyer), the parents, and the individual leaving home should work closely with one another to make sure everyone is protected appropriately. Education and communication go a long way in this area, and the good news is that the solutions are not expensive. Left unaddressed, the financial and emotional ramifications of inadequate coverage can be devastating.